hi everybody! so I just got back from another long day in Yangon – and yet I had another great day with soooo much to see and experience! first I started out with a walk towards downtown, which took me instead of the suppposed 20 minutes about 1 hour, because I didntknow where to look first! so much life going on in the streets, and once again I was the ONLY tourist on the street. everybody looks at you as if you are the first foreigner they have ever seen..a very unknown feeling! I aw food stalls offering interesting looking and smelling food, I saw puppies being sold in boxes, saw people reading and sleeping on the streets in the shade (1 minute after you go out of the guesthouse you are totally sweaty!) and tons of schoolkids smiling and giggling at you, screaming HEEELLO! I walked to a 2000 year old pagoda which is in the middle of Yangons busiest roundabout and listened to the people singing prayers and meditating. A young student chatted me up (they are very keen to practice English and ask you many many quesions about your country and what you think about Burma) and taught me many things about Buddhism. we then walked to an area where very poor people gather to eat food (about 10 cent for street food, not recommended for the tummies of tourists though!).. I got to change my money finally -very strange procedure indeed (and I have NEVER walked around with plastic bags full of cash!) and then I headed off to the highlight of Zangon. 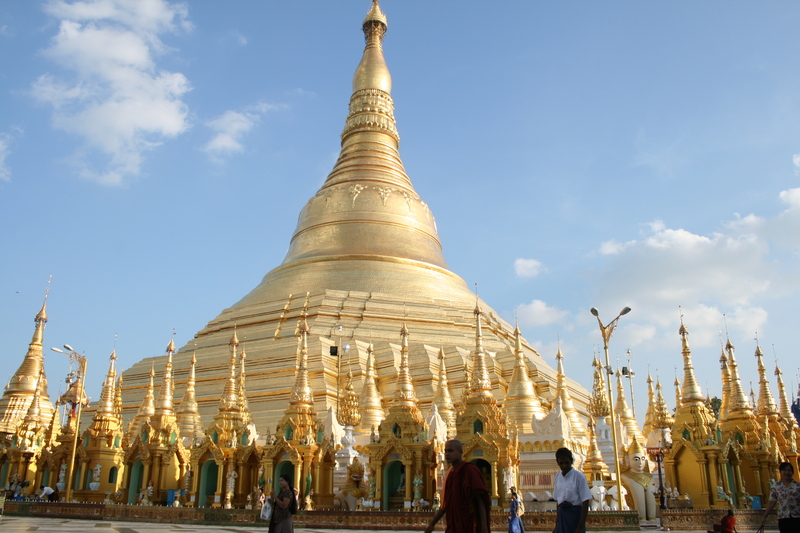 THe Shwedagon pagoda. For the FIRST time of my life the saying “it took my breath away and made me cry” came true. As I walked up the stairs and first saw the big plateau with its countless golden pagodas I started crying and couldnt beliee the beauty of the place. I spent 4 hours there until it was dark, and it is undescribable how amazing this place is. cant wait to upload photos when I am back home (not going to happen here with the internet connection). Posted by Brita Graser on 14. December 2010 in Burma 2010/11 and tagged buddhism, cities, temples.